In Cleveland, about 40 cyclists ignored the pouring rain and thunder to join Jody Orlovick who organized the ride. A number of councilmen, representatives from the Mayor’s office and local members of the police were also present. Emelio DiSabato, Sylvia’s friend and roommate, spoke about Sylvia. His moving speech is posted on YouTube. Pictures and other videos of this event can be found on the Ride of Silence, Cleveland, Ohio Facebook page. Steve and Francoise with their friend Angelo Douvos joined local cyclists for a Ride of Silence in Tiburon, in Marin County, California. The event was organized by The Marin County Bike Coalition and was dedicated to Sylvia. The turnout was small, 15-20 riders, but more than twice as many as last year. The weather was perfect and the route around the peninsula spectacular. Thank you to all of those who joined us for this event. Learn the basics of safe cycling, riding in traffic, equipment, crash avoidance, rights and responsibilities, from a certified bicycle safety instructor with the East Bay Bicycle Coalition. 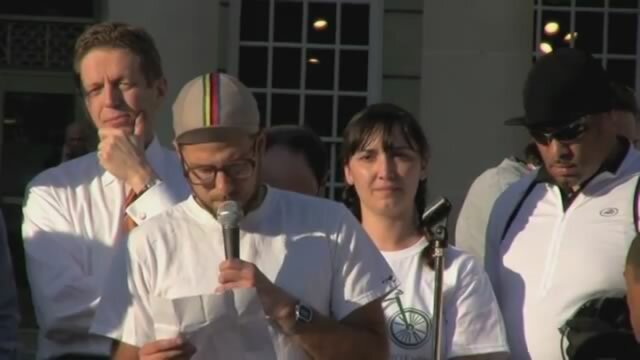 A golf tournament and dinner benefiting a fund for a former San Rafael woman killed riding her bicycle in Cleveland last year raised about $2,500, organizers say. The scramble tournament and dinner benefiting the Sylvia Bingham Fund occurred last Saturday at the Peacock Gap Country Club & Spa and attracted 32 golfers and about eight more people for dinner, organizer and golf pro Paul Rojas said. The money raised at last week’s tournament will go to the Sylvia Bingham Fund, with the Massachusetts-based Peace Development Fund handling donations and deciding which charities to fund in consultation with the Bingham family. The family plans to suggest donations to the Marin County Bicycle Coalition, Terra Linda High School and organizations that promote healthy eating habits, particularly among children, Steve Bingham said. 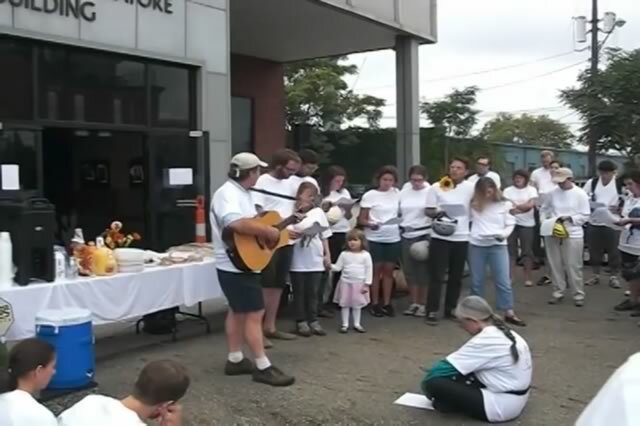 In the morning of September 15, 2010, exactly a year after the tragedy, Steve, Francoise, their nephew Alfred, Sylvia’s close friend Jill and a group of other friends and bike activists left Sylvia’s house in the Tremont neighborhood of Cleveland to retrace her route to work at Hard Hatted Women. They stopped at the corner of Prospect and 21st Street and placed flowers on the Ghost bicycle, which is still there, then completed the ride to Hard Hatted Women, where they were received by the director, staff and board members and Americorps VISTA volunteers. Ride of Silence events are held every year on May 18 at 7:00 PM in hundred of locations world wide.The first Ride of Silence took place at White Rock Lake in Dallas in 2003. 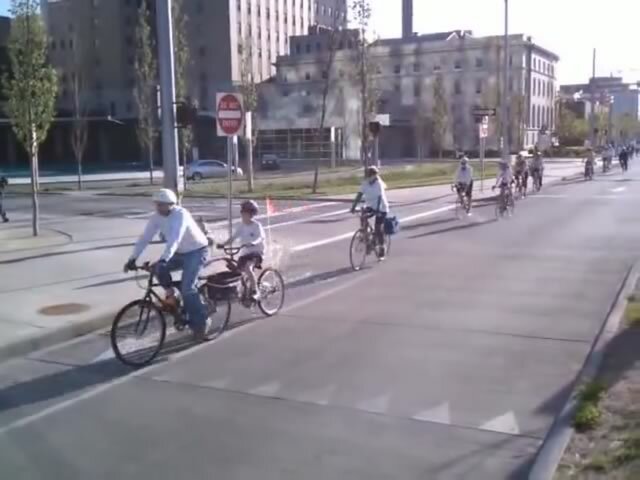 This unformal event, attended by 1000 cyclists, was organized by Chris Phelan to honor the memory of his friend Larry Schwartz who was killed by a school bus mirror on May 4 2003. 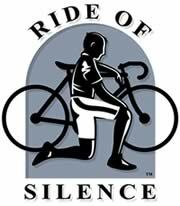 The mission of the world wide Ride of Silence is to honor bicyclists killed by motorists, promote sharing the road, and provide awareness of bicycling safety. For more information go to http://www.rideofsilence.org. Two starting points (Cleveland City Hall and Whole Foods Market) converged at a central meeting place (University Hospitals). 350 riders, mostly wearing white. We had wonderful support from Cleveland Police as well as a number of other police departments along the route. It was an uplifting and inspirational event that included speakers who talked about the growth of bicycling for transportation and the need for all road users to respect each other and share our roadways. Speakers also included Bob who has rebuilt his life after being partially paralyzed in a crash, Alex who read a statement from the parents of Sylvia who was killed by a right-turning truck and Gary who talked about his co-worker Charles who was killed while commuting to work. This event has helped galvanize and strengthen the budding bicycle advocacy movement in northeast Ohio. This study was done for the city of Vancouver, BC – Cycling for Everyone, Lessons for Vancouver from the Netherlands, Denmark, and Germany. It explains how Denmark, Germany and the Netherlands have made cycling so much safer than cities in North America. A truck mowed down Sylvia Bingham in September, killing her as she rode her bicyle on Prospect Avenue headed to work at the offices of Hard Hatted Women, Inc. The Yale graduate’s ghost bike, though, lives on. Jim Sheehan of the Ohio City Bicycle Co-op, which put up the memorial, said people regularly add helmets, turning the memorial into a sort of public art display. The helmets, he said, can be taken by those who need them, in keeping with Bingham’s giving spirit. But helmets aren’t the only issue. Bingham’s family has established a fund in the name of their daughter, a California native in Cleveland for a yearlong stint as an Americorps Vista volunteer, to demand the right for people to bike safely and to educate people about how to share the road. The driver who hit Bingham, Herschel Roberts, has been charged with aggravated vehicular homicide and driving while under the influence. CLEVELAND, Ohio — A 61-year-old Cleveland man was indicted Thursday for vehicular homicide and driving while under the influence in a Sept. 15 accident that killed a 22-year-old bicyclist, the Cuyahoga County prosecutor’s office said. Herschel Roberts was also indicted for failure to stop after an accident. Prosecutors said that Roberts drove a 2005 Peterbilt Straight truck near Prospect Avenue and East 21st Street when he struck Sylvia Bingham and left the scene. Roberts’ truck was found an hour later in the 1100 block of East 40th Street. Police said he tested positive for marijuana. He is scheduled to be arraigned on Nov. 2. Bringham, a Yale University graduate, was killed as she rode from Ohio City to work at the Hard Hatted Women office, where she helped tradeswomen become mentors. CLEVELAND, Ohio — As someone who was passionate and city living and the environment, Sylvia Bingham’s preferred way of getting around Cleveland was on her bicycle. While riding her bike to work about a month ago, the 22-year-old died when she was hit by a truck near East 21st Street and Prospect Avenue. On Saturday, Bingham’s family and friends gathered for memorial bike rides — here in Cleveland and others in her home state of California — to remember the way she lived and to promote safer roads. “It makes all of us involved in organizing it feel like something positive came out of her accident — even if it’s just all of us being together,” said Alex Nosse, 25, who was Bingham’s boyfriend. Nosse was among about 30 people who arrived on Saturday morning at Edgewater Park, the starting point of the memorial bike ride here. Bingham, who lived in Tremont, liked to swim at the beach at Edgewater, Nosse said. From there, the bikers planned to split up into groups and head to different destinations: Clark Fields in the Tremont neighborhood for a bike education event; the Morgana Run trail in Slavic Village to paint a mural Bingham helped design; and an East Side urban garden that supplies produce to local markets. After the bike ride, everyone planned to meet at Edgewater to pick up some of the litter nearby — a tribute to Bingham’s concern for the environment. “I just want to keep thinking about Sylvia and things she wanted to do,” said Jill Collins, Bingham’s best friend, who lives in Ohio City. Bingham’s parents, meanwhile, organized a separate set of bike rides in California to honor their daughter, who grew up in San Rafael, Calif.
Bingham arrived in Cleveland not long after graduating from Yale University in May. She had friends here and found a job at the Hard Hatted Women office, where she helped women working in the building trades become mentors to other women. Stephen Bingham, her father, said he wants to prevent similar deaths. He said his daughter was almost certainly in the truck driver’s blind spot when she was hit. She was not wearing a helmet, he said, but it would not have prevented her death because the truck struck her in the midsection. The driver faces possible criminal charges, police said. Stephen Bingham said he is dedicated to making sure trucks, within the next five years, are required to have technology to alert them when somebody is in their blind spot. “If there’s something we can do so that her death means that a whole bunch of other young people may not die, then we can get some meaning out of this horrible thing,” he said by telephone Saturday. Nosse, Bingham’s boyfriend, said drivers on the road need to be more aware of bicyclists and their right to the road. Nosse said he has been car-free for six years. Instead, he relies on his bike and public transportation — a philosophy Bingham held as well. “She and I both thought biking was a healthier way to live,” he said. As he got ready to begin riding, Nosse fixed a helmet on his head — a requirement for Saturday’s ride in Cleveland. On Tuesday September 22, 2009 about 150 Cleveland friends, neighbors and sympathetic bike riders joined a silent memorial ride to commemorate the death of Sylvia Bingham. 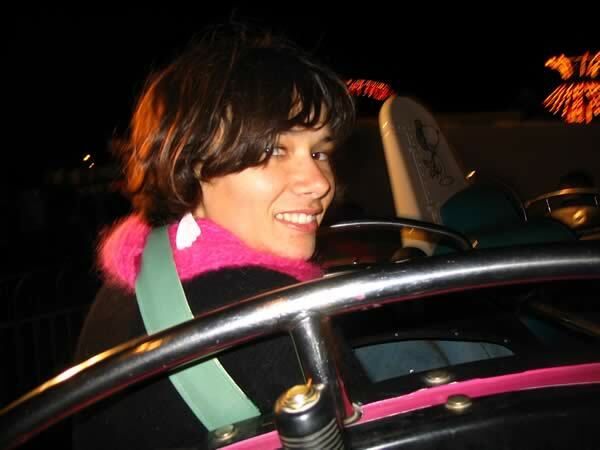 She was killed on September 15 while riding to work. The Sylvia Bingham memorial ride will be taking place this Tuesday, September 22nd, at 8:00am (that’s the same day as the general interest meeting, just 12 hours earlier). Here are the details: Meet at Sylvia’s Tremont home at the intersection of Fairfield and West 11th at 7:30 AM. 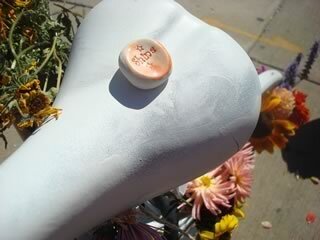 The ride will begin at 8:00 on Tuesday, September 22nd–on the 1 week anniversary of Sylvia’s accident. We will have a limited number of white “I RIDE FOR SYLVIA” T-shirts available for a goodwill donation. Please wear white shirts. Helmets are required, and loaners will be available at the site if you don’t have your own. This is an incredibly important event for all of the greater Cleveland cycling community, and we hope you can make it out. 4000 More will be helping organize carpools (with bike racks, of course) to head out from Oberlin in time for the ride– if you have a car and want to help get people out, or you don’t but you want to be there, PLEASE email 4000moreoberlin@gmail.com and we will help you get transportation. These are our shirts. 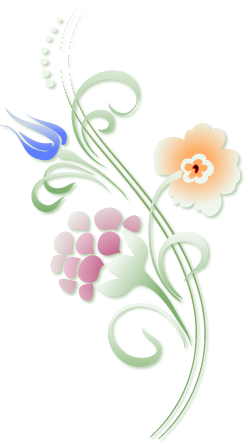 The design, inspired by Sylvia’s idea, was a collaborative effort by her friends. On Monday night, Ayla and Alex went to the Oberlin College Silkscreen Studio to print shirts for Tuesday’s ride. Thanks to guidance and help from Asa, a senior at Oberlin, they were able to print 200 shirts by hand. Above is Alex holding a freshly printed shirt in the studio and two bikers at Sylvia’s house before the ride. We will be printing more “I Ride For” shirts for the next ride on October 17th so be sure to let us know if you would like one. We ride for Sylvia. Sylvia Bingham ’09, a Yale graduate who was passionate about social justice and the environment, died Tuesday morning. She was 22. Bingham was en route to her job in Cleveland shortly before 9 a.m. when a truck collided with her bicycle. She passed away at St. Vincent Charity Hospital soon after. The truck driver did not stop, but police located him that afternoon using information provided by witnesses. No charges had been filed as of Tuesday afternoon. A California native, Bingham moved to Cleveland after graduating to work at the organization Hard Hatted Women, which helps to lift women out of poverty. She described herself on LinkedIn, a networking Web site, as being passionate about eliminating urban poverty and creating job opportunities in the skilled trades. “Eventually I’d like to see urban, sustainable agriculture generate high-wage, high-skilled green jobs in our cities,” she wrote. Bingham believed that people could make a difference in the world and devoted her life to social justice and environmental issues, her college roommate Lucia Diaz-Martin ’09 said. She was described as kind-hearted and effervescent, someone who cared deeply for her friends and family. Bingham would drop anything for her friends, Anna Parks ’09 said. Another college roommate, Molly Fischer ’09, said Bingham made their apartment at 67 Edgewood Ave “the coziest little home in the world” last year. A talented chef with a colorful palette, Bingham enjoyed throwing dinner parties for her friends. 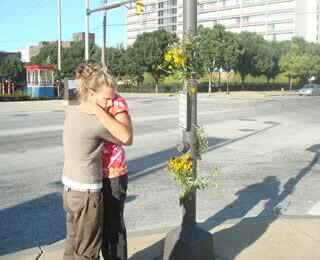 News today of a tragic loss in Cleveland, Ohio, at the hands of a hit-and-run truck driver. The local Fox News affiliate reports that Cleveland Police say 22-year-old Sylvia Bingham was riding in the curb lane of Prospect Avenue at East 21st Street around 9 A.M., just a few blocks from where she was to start work that morning. A large truck turning onto East 21st hit Bingham, knocking her off of her bike and running over her. The truck didn’t stop (though the driver was later found). Fox also features an interview with Sylvia’s colleague and photos of the scene, which is clearly not a “complete street” despite being in the heart of a dense urban district. Details are still sketchy, but unfortunately, the facts of the story sound painfully similar to a 2006 incident in which Alex Capelluto (who was one class ahead of Sylvia at Yale) was killed by a truck while bicycling in West Haven, on the way back to campus from the Yale Boathouse. The 22-year-old Yale University graduate was killed Tuesday as she rode her bicycle to work at the Hard Hatted Women office, where she helped tradeswomen become mentors. “I am passionate about eliminating urban poverty, particularly by creating job opportunities in the skilled trades,” Bingham described herself, on her LinkedIn page. I was lucky to meet Sylvia, and witness the blooming growth of a person of exceptional intelligence and a good heart. She was taking a course with Doug Rae, and contacted me when scouting for a local development project to research. She chose Dixwell Plaza. In addition to reading about the history and architecture of New Haven’s redevelopment period, she interviewed store owners and customers about their use of the place. She had great talent for field work because she could put herself in other people’s shoes. She was destined to do great work in the world. Her death is a tragic loss. Bingham, who just moved to Cleveland for a job at organization that helps impoverished women, was a vivacious and dedicated woman – an inspiration to all who crossed paths with her. Effervescent, vivacious, and compassionate, Bingham lived her ideals, striving to improve the world while always taking the time to care for her friendships. CLEVELAND, Ohio — Sylvia Bingham only lived in Cleveland for a short time, but she was determined to make a difference in the community. 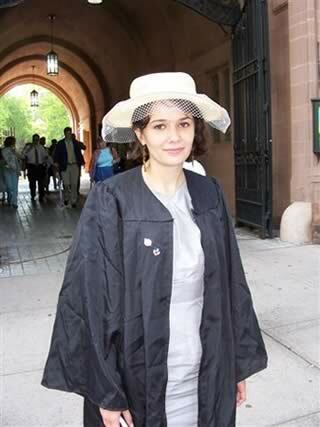 The 22-year-old Yale University graduate was killed Tuesday as she rode her bicycle (a previous version of this story misidentified her vehicle) to work at the Hard Hatted Women office, where she helped tradeswomen become mentors. She was run over by a 2005 Peterbilt shortly before 9 a.m. at East 21st Street and Prospect Avenue. The truck driver did not stop, but police found him a short time later on East 40th Street, thanks to information provided by witnesses. Police questioned the driver to determine if he was aware that he had hit the woman and to find out how the accident happened. No charges had been filed Tuesday afternoon. Bingham came to Cleveland after studying French and sociology at Yale. The 2009 graduate was passionate about people and the environment. Her father, Stephen Bingham, said his daughter planned to make America a greener place by working to repair the environment. She worked at Hard Hatted Women through the AmeriCorps Vista program. Her friends and co-workers talked about the young woman’s energy and self-sacrifice, which she expressed most of her life. “I am passionate about eliminating urban poverty, particularly by creating job opportunities in the skilled trades,” Bingham described herself, on her LinkedIn Web page. “Eventually I’d like to see urban, sustainable agriculture generate high-wage, high-skilled green jobs in our cities. It’s exciting to see the proliferation of farms [and] in Cleveland’s abandoned lots. She worked or volunteered in similar jobs in other cities while in high school and college. Stephen Bingham said his daughter was excited about living in Cleveland. She had recently moved in with her best friend from high school. Bingham said he hoped that, even in death, his daughter can teach people one final lesson. Police confirmed that she was not wearing a helmet at the time of the accident. There have been several recent fatal accidents involving bicycle riders in Northeast Ohio, including a 65-year-old Cleveland man and a 13-year-old Green boy. Neither wore helmets at the time of their deaths. The Sylvia Bingham Fund will help Americans demand the ability to walk or cycle safely to work, school, church or shops. The Fund will promote safety for cyclists and pedestrians by educating drivers about sharing the road with cyclists and pedestrians and educating cyclists on defensive personal safety techniques. The Fund will also work with others to encourage state and federal transportation agencies, city and county planners, legislators and policy makers to provide for cyclist safe zones and other engineering controls in areas of high traffic to reduce the risk of injury. CLEVELAND — A recent college graduate who just moved to the Cleveland area three weeks ago was killed Tuesday after being struck while riding her bike downtown. Sylvia Bingham, 22, was riding her bike across East 21st Street down Prospect Avenue when she was hit by a truck. Bingham’s boss, Terry Burgess Sandu, said the Yale graduate started working at Hard Hatted Women in Cleveland on Aug. 24. Police said Bingham was on her way to work when she was struck near Cleveland State University’s Wolstein Center. She was rushed to St. Vincent Charity Hospital, where she died at 9:10 a.m.
Police said the driver of the truck took off, but police found and questioned him Tuesday afternoon. Bingham, a native of California, moved to Cleveland to volunteer with Americorps Vista. She was donating a year of her life to help women climb out of poverty. “This is a young woman with many choices, but with close friends here, she chose Cleveland and she wanted to make a difference for a year,” said Burgess Sandu. Bingham recently told her boss how much she liked Cleveland. “We just talked yesterday about what she liked about Cleveland, and the lake and the things we take for granted. She talked about the cost of living and how much she liked her apartment and other Vista member,” said Burgess Sandu. In her resume, Bingham wrote that she was dedicated to imagining and creating a better world. Police said Bingham was not wearing a helmet. No charges have been filed at this time against the driver of the truck, who works for a local electric company, but the investigation continues.